The Euro failed to make the most of a broadly weaker US Dollar on Thursday, shedding around half a percent of its value during the London session following more disappointing economic news out of Germany and Italy. ata out yesterday confirmed that Italy, the Eurozone’s third largest economy, fell into a technical recession in the final quarter of 2018. The Italian economy shrank by another 0.2% quarter-on-quarter following a 0.1% contraction in Q3. This marks the first time the country has entered into recession, signified as two consecutive quarters of negative growth, since 2013 and comes off the back of an eventful year filled with political turmoil and fiscal tensions. The Eurozone as a whole fared little better, expanding by just 0.2%, its joint lowest level in four years. As we have mentioned on a number of occasions recently, we think that such soft growth numbers, and the absence of inflationary pressure, ensures that the chances of an interest rate hike from the European Central Bank in 2019 is effectively zero. This could keep gains for the Euro limited this year. Sterling was back under pressure again this morning, slipping back below the 1.31 mark against the US Dollar after the latest PMI data suggested that Brexit uncertainty was having an impact on UK business activity. The manufacturing PMI for January fell unexpectedly to 52.8, down on December’s 54.2 and well below the 53.5 consensus (Figure 1). This marks the measures second lowest reading since mid-2016, suggesting that the UK economy may have got off to a rocky start to 2019. 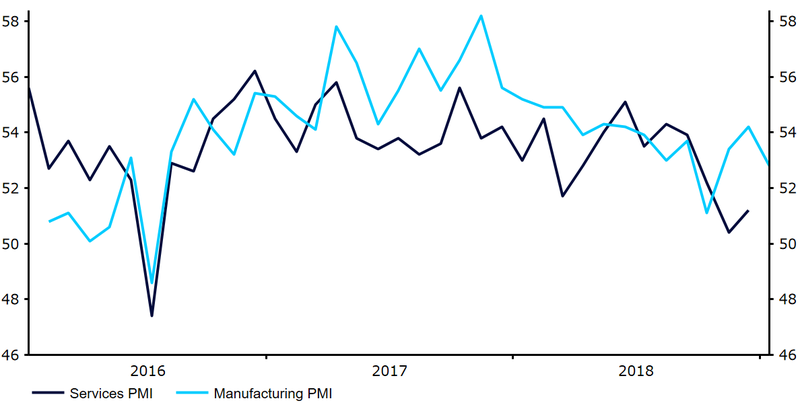 That being said, with manufacturing now a very small contributor to overall activity in the UK, we await Tuesday’s far more meaningful services PMI before jumping to conclusions regarding the health of the UK economy. Will today’s US payrolls report help the Dollar? Attention in the currency markets today will turn firmly to this afternoon’s US nonfarm payrolls report, although with the Fed this week suggesting that it may be done with its rate hike cycle, today’s report could take on slightly less importance than usual. Economists’ are pencilling in a nonfarm payrolls numbers of around 165k. Given the lack of appetite among Federal Reserve policymakers to raise rates again any time soon, we think we would need to see a number well in excess of the 200k mark to lead to any form of meaningful rally in the greenback today.